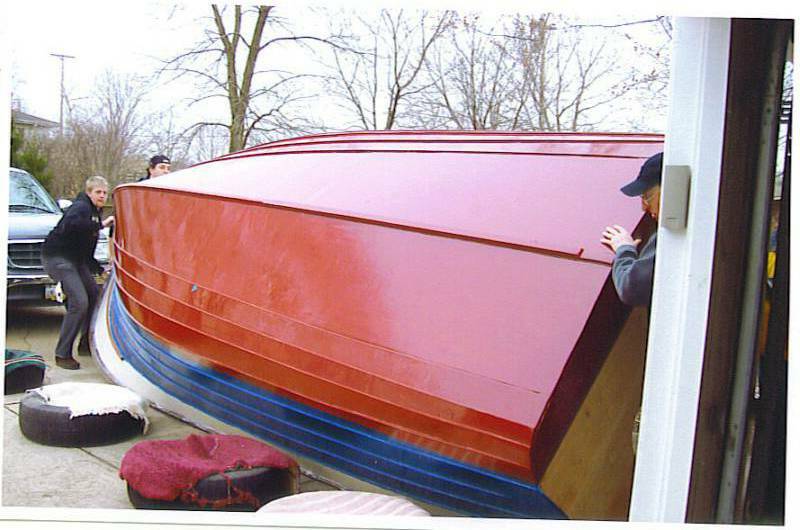 Who are Wooden Boat Owners? 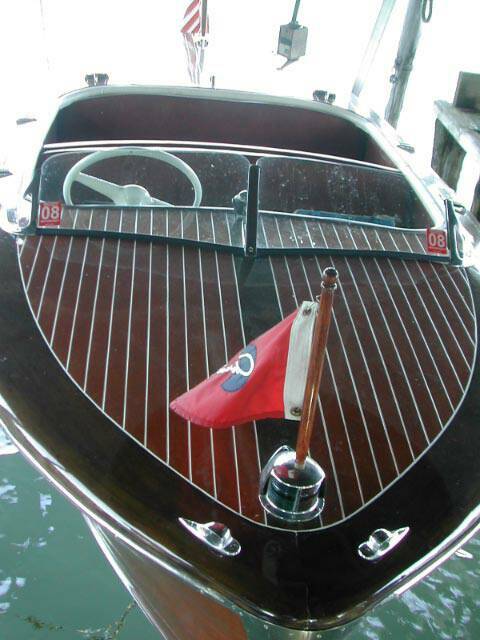 There's no denying that these classic wooden boats turn heads on the water and even on the road! Every boater would love to have one of these fancy boats, but you really have to be rich to be able to own and maintain one, right? Wrong!! In fact, it's very wrong. Classic boat owners come from all walks of life and all ranges of income. From the president of the company to the plumber (the plumber being the rich guy! ), everyone can afford to enjoy the beauty and fun of these classic watercraft. 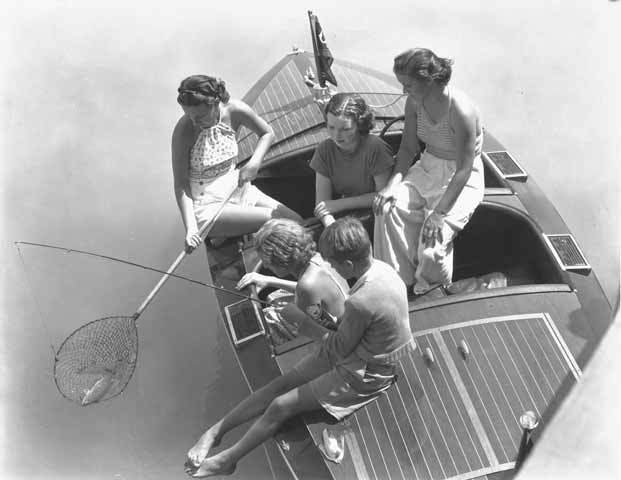 It was the growing middle class that bought the most boats back in the 1920s when pleasure boating became wildly popular in America and wooden pleasure boats are still popular with American families today. Tubing, skiing, cruising or fishing, classic boats are well-suited for anything families do on the water. Hundreds of models were designed for the boating market, even in the early days of the industry. Some were designed with the rich in mind, but most were made for the average American. Compare the cost of owning a classic boat to the cost of owning a contemporary model and you'll see they're just as affordable today as they have ever been! 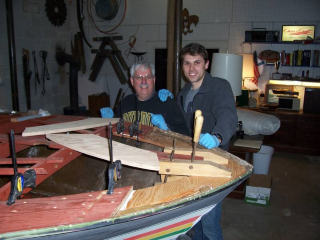 Our customer Steve is CEO of his own company, but he works on his wooden boat right here in our shop every chance he can get! This work is very satisfying and is a stress-reliever for Steve. We work side-by-side with Steve in the shop. Steve gives us business advice and we give him sanding advice! 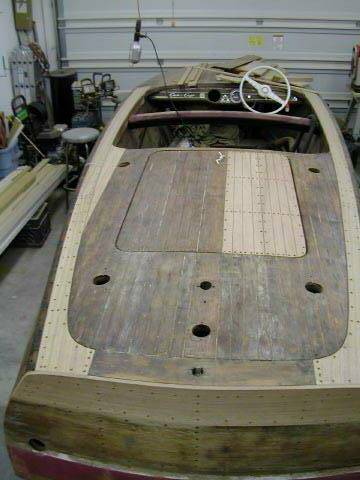 Take a look at the progress he has made on the 1961 Ski Boat page! Adam, pictured here with Paul, has been out of school just over a year and he's already restored his own '68 Cheetah! Adam is an investment broker by day and by night he restored his boat that had been in the family for many years -- first the Grandfather and then a cousin. This is a fiberglass classic to the deck of which Adam added a Mahogany plank surround. 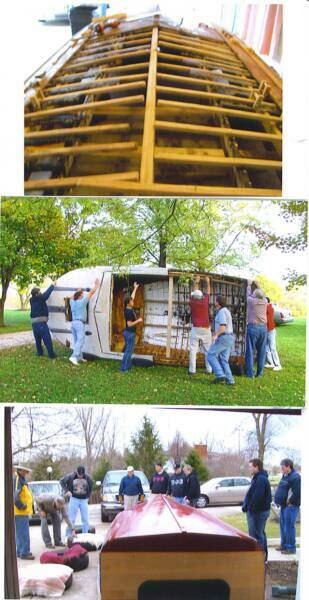 He also did some structural repairs, rebuilt the engine, and painted the hull. Check out the page on the 68 Cheetah and see its transformation. Betty, rescuer of the Chubby-D, pictured with her woodcarvings. Artist and carver of birds and "found" wood. Betty comes from a long line of artists ... one that painted the first ever Coca Cola sign!! Betty and her husband Jim (who sharpens the wood-carving tools) rescued the 1954 20' Sportsman from an owner that had a "spiritual problem." These folks had the ability to see the finished product when looking at the derelict Sportsman that had spent 10 years or more in the weeds near their home .... just like when Betty looks at a piece of found wood and decides what it is to be, once carved. Her son now owns the boat and is having it restored in our shop. Hugh, a senior truck driver for UPS, has a 1968 Grand Prix that he and his family enjoy. Hugh and Millie are continually improving the appearance and performance of this boat. 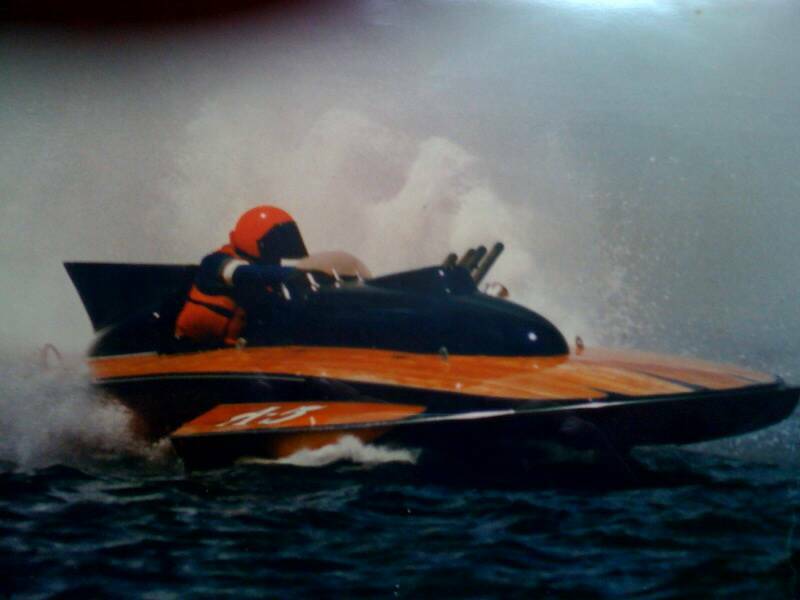 Hugh used to race a Hydroplane named "Mahogany Rush" and his dad raced "Big Chief" -- both 135-mph-capable wooden hydroplanes! Yes, that's what the ones you remember were made of -- WOOD! And many are still made of wood today! The kids are active in gymnastics and scouts. Hugh comes down and stays with us on the Woodies flagship, the Phoenix, every chance he gets (which isn't often enough!). For all of us at Woodies Restorations, one of the most rewarding parts of this business is getting to know the customer. We'd like to get to know you too! David, a retired GE executive and long time woodworker purchased this 1965 Thompson and it's trailer for a modest sum and proceeded to bring it to a seaworthy condition. They have scarfed in some new planks on its lapstrake sides and now it is quickly approaching better than new overall condition. David and Janet removed the bottom and replaced most all of the steam bent white oak ribs. While talking to David, it was clear that he chooses to fill his life with the purpose, challenge, and satisfaction we all find in our projects. 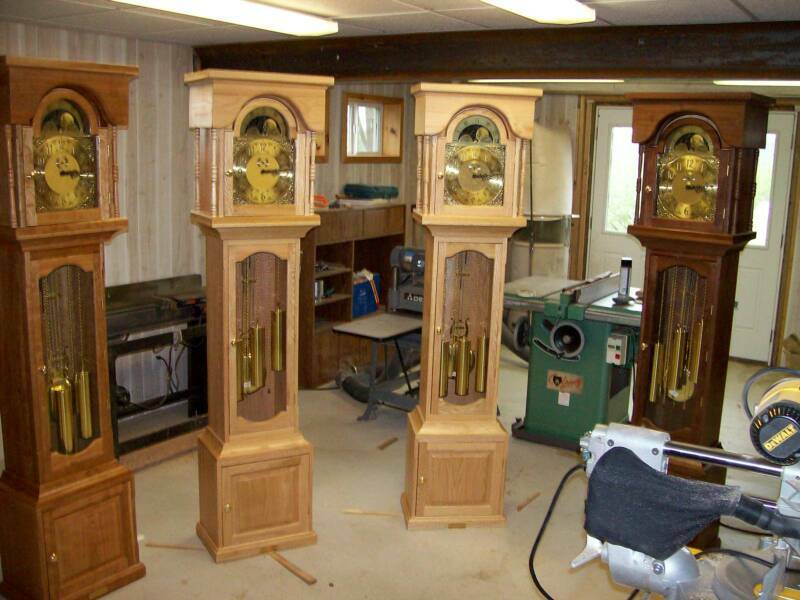 Before tackling this project, he completed some four grandfather clocks as gifts to his four sons. When asked about his next project he replied, "I haven't built an airplane yet!" I'd say we all need to stay tuned and check this page occasionally for that project update, as Janet didn't protest (too strongly)!! 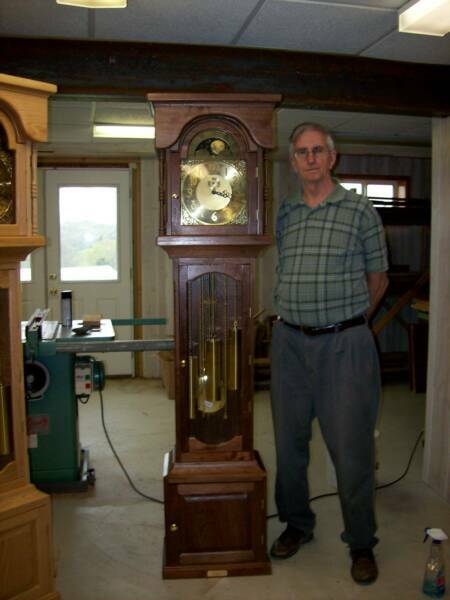 By the way.... just take a look at the 4 grandfather clocks he built for his children before he got hooked on boats! When you see the clocks, then see the boat, you ask yourself.... why not an airplane? Of course, I think he needs to do about 3 more boats. Four Children, Four Clocks, Four Boats ... makes sense doesn't it? 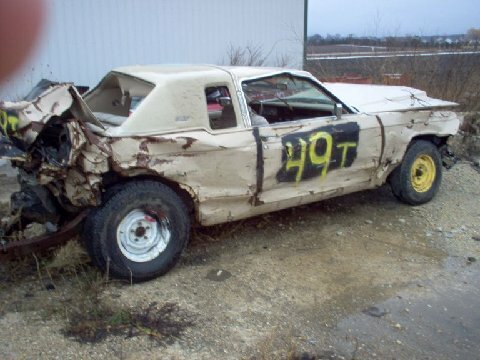 One of our newest customers, Ryan, pictured above in the #49T, builds and entertains as he destroys Demolition Derby Cars! Ryan also restores classic cars, and Hot Rods them as well. Ryan is the proud owner of a 1965 Chris-Craft 33' Sea Strake and is getting ready to restore her to her former glory. Obviously, this motor-minded person will be doing all the mechanical work, as we restore and refinish the hull. Jim, from Harsens Island, Michigan, lives across from the original Chris-Craft plant in Algonac. If I'm not mistaken, the plant is behind him in the picture of him in his boat shown above. 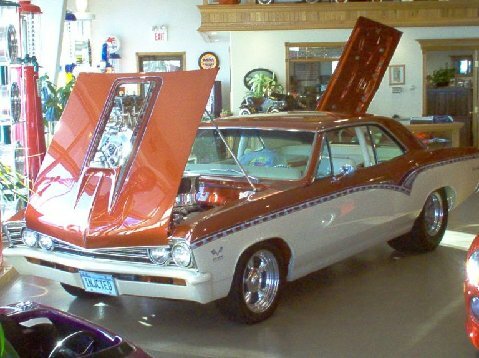 Jim has done several fine restorations like the ones pictured above. Is it something in the water that gave you those skills, Jim? 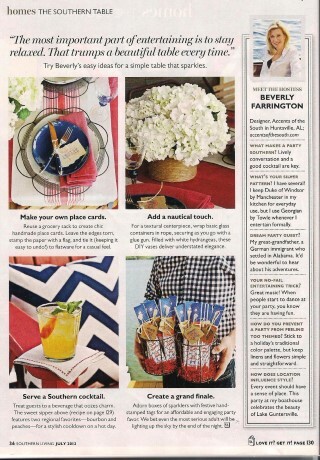 An article about Betty displaying her works in a Major Art Museum in Atlanta! We have an author in our midst! Mark owns the 1956 Custom Build you can find on the Completed Work page. Mark flies as a captain on a major cargo and package carrier and in his spare time has authored 3 books and many articles. He started flying at age 13 and completed his USAF training in 1976. 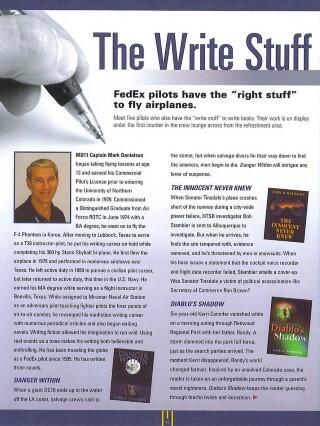 He was first published in 1978 and twice recognized as the Navy's top aviation safety author! I typically only read technical information that allows us to keep these great old boats in the water and operating reliably, so I rarely get to read for enjoyment. That being said, I have personally read Danger Within and it is a can't-put-it-down thriller! See Mark's web site! FedEx flies all kinds of cargo. Animals are among the most interesting. I have flown sea turtles, horses, a variety of birds, and ferrets, and can now add a hippopotamus to that list. This is Tucker's story. If he could write, he would have painted a sign that read, "Eight Year Old Male Hippo in Need of New Home." FedEx came to his rescue, donating their services as a hippotarian gesture to move him from the Topeka Zoo to the San Francisco Zoo. Delivered under perfect flying conditions, Tucker is now busily exploring his new surroundings. Tucker's story is as interesting as his journey. Born in captivity at Disney's Animal Kingdom, he was destined to be relocated to the San Francisco Zoo over a year ago, but the timing wasn't right. Instead, he was transported to the Topeka Zoo where he met a lovely mate with bountiful proportions. They instantly fell in love and had a baby together on August 21, 2010. But this miracle of birth proved to be Tucker's downfall, for the Topeka Zoo isn't large enough to accommodate three hippos. One of his handlers told me that while Tucker is very docile, the handlers were concerned that Tucker would inadvertently kill his baby by playing with him. Since the baby needed its mama, Papa Tucker was being banished like Adam, except that he would leave his Eden with a stock of apples. On January 6th, 2011, Tucker flew from Kansas City to Memphis, then patiently waited for me and my first officer to fly him to Oakland. His oversize crate was approximately 1-1/2 times the size of a normal MD-11 pallet. 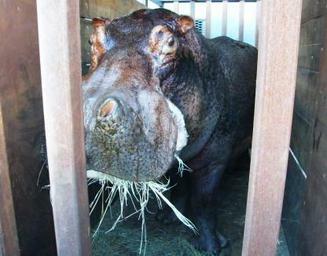 Loaded with hay and food, he was monitored by two handlers and a veterinarian. Before we took off, they assured me he was as comfortable as any hippo could be. I nodded while detecting clear evidence that his internal organs were functioning perfectly. Thankfully, our airplane's rigid cargo barrier confined his distinct aroma to the upper cargo compartment rather than allowing it to invade the cockpit. Otherwise, it would have been a very long flight. Thanks to good weather, Tucker probably never knew he moved. He was a perfect passenger throughout our entire flight. Had he been upset, we definitely would have known, since annoyed jumbo animals tend to bounce airplanes. But Tucker did none of that. Instead, our four thousand pound puppy seemed quite content. On our initial descent into Oakland, the Oakland Center controller assigned a step-down altitude. To make it easier on Tucker's ears, we requested a constant descent because of our special cargo. The controller then asked if we had horses on board. Upon hearing it was a hippo, he replied, "Cool." From then on, we received special handling that never required us to level-off. Tucker's information was passed from controller to controller to ensure our smooth arrival. I elected to use the full runway length, so our deceleration was gradual. The taxi-in went as smoothly as our taxi-out. From Oakland, Tucker's crate was transported to San Francisco via flatbed truck. 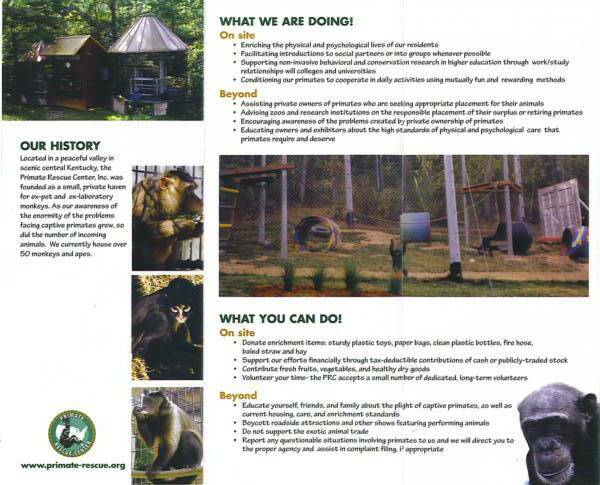 The SF Zoo was very appreciative of FedEx's service, and I was happy to be among those playing a part in his relocation. Far more people were involved in this operation than I will ever know, but Tucker's transfer was successful because it was a team effort. Now single again, Tucker is free to find a new mate while enjoying California's moderate climate. San Francisco may not be Disney World, but it's far better than winter in Topeka. 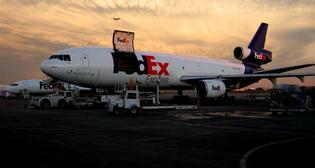 As for FedEx - we again proved that we deliver the world on time. Beverly owns a 1946 Chris-Craft 22' Utility, or U-22. 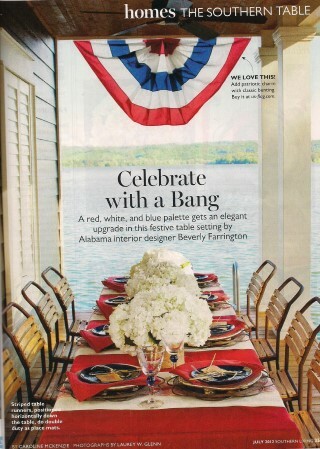 She owns her own interior design firm in Huntsville, AL, called "Accents of The South." 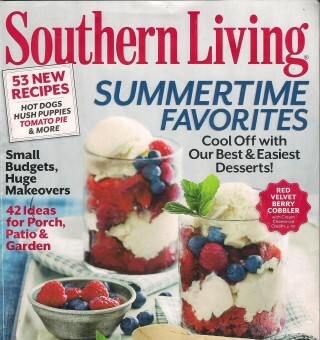 This is only one of the many magazines her work has been featured in. 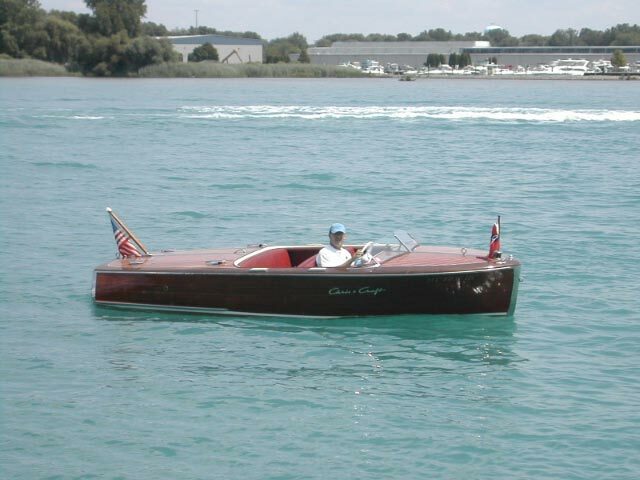 Steve enjoys classic boats, like the one we take care of for him -- his 1956 Chris-Craft Holiday. He also enjoys restoring classic bicycles. He is pictured here with a Schwinn. While William Hartman may not own a boat, he is the very talented son of Mike Hartman, who is the proud owner of a 1968 Chris-Craft 33' Futura. William has been learning to play the banjo for a few months and already has a talent for it.